NASCAR Xfinity Series team JR Motorsports and GMS Racing, which competes in the NASCAR Gander Outdoors Truck and Xfinity series, already have a technical alliance. On Thursday the teams jointly announced the formation of a driver development program, called Drivers Edge Development, by Chevrolet. Steps in the program include regional late models, NASCAR K&N Pro Series, ARCA, the Truck Series and Xfinity Series. The top level of the program will be a JR Motorsports ride in the Xfinity Series. “Drivers Edge Development is going to be critical to the future of the sport and our race team,” JR Motorsports General Manager Kelley Earnhardt Miller said. “The fact that you have JRM, GMS and Chevrolet involved in getting this off the ground speaks to that importance. We’re emphasizing on-track experience in multiple series while still keeping the drivers under the Chevrolet umbrella. Off track, we’re going to offer these drivers decades of industry knowledge and best practices with the goal of helping them become the best versions of themselves in all aspects of the sport. 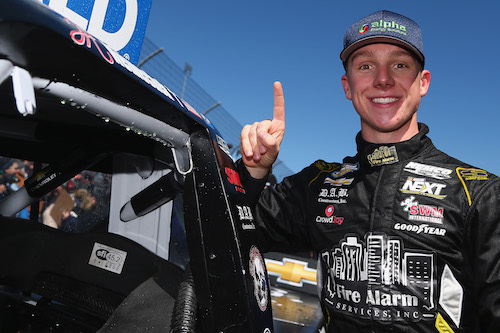 Six drivers are enrolled in the program — JRM Xfinity Series driver Noah Gragson; GMS Xfinity Series driver John Hunter Nemechek; JRM part-time driver Zane Smith; GMS Truck Series driver Sheldon Creed; GMS Truck, ARCA and K&N driver and JRM late model driver Sam Mayer; and JRM late model driver Adam Lemke.